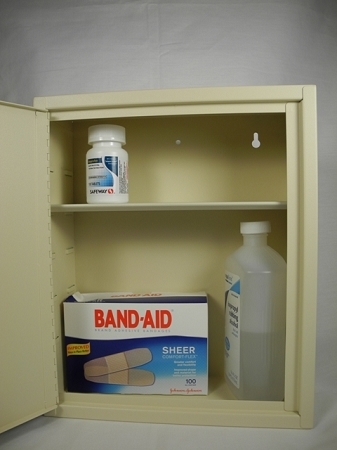 This versatile locking storage cabinet can be used as a locking medicine cabinet or a wall mount locking storage cabinet. It's large capacity is designed for medicine or any supplies that need to be under lock and key. The cabinet can accept a variety of locks from simple cam locks to electronic locks with multiple access codes. And now we offer the enhanced Kitlock keyless electronic lock - the KL1550. This lock has all the features of the KL1000 , but it also offers you the ability to require 2 unique user codes be entered to open the lock. This dual access control turns your medicine or storage cabinet into a restricted access storage system without the possibility of lost keys. Choice of locks: Wafer, combination lock with key override, electronic lock, or electronic lock with dual code mode. But only the standard wafer lock (front - center) is made in the USA. Exterior dimensions 12"h 10"w 4"d.
Multiple units can be supplied keyed alike, add $7.95 ea.